Sump pumps are the mechanical devices responsible for groundwater removal in basements or lower levels. There are a number of components to the system. A sump basin or pit collects the groundwater. 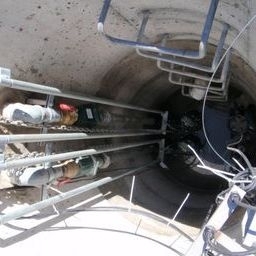 Float switches activate the sump pump when water levels in the sump basin reach what is called ”the critical level”, and the pump moves the water up and out to the storm sewer. The slopes of the North Shore hide many underground streams and valleys. If you have an area of your driveway or yard that is constantly wet or sinking, a sump may be needed. We can also install multiple pump systems with high water alarms in critical applications, where rising water is a concern in regards to property damage. After our initial assessment, we will recommend the right product for your home ensuring that you have the equipment in place to prevent flood damage to your home and belongings. Is your sump pump not working? Call us for all your sump pump emergencies. We are on call 24 hours / day. We have the knowledge to get your pump working again. Whether it’s installation, repair, or maintenance, R&B knows sump pumps. Good fast service they even squeezed us in so that we did not have to go a whole weekend without heat.